Bruce & Anezka and their team provide a quality & professional In-Home Pet Minding Service. 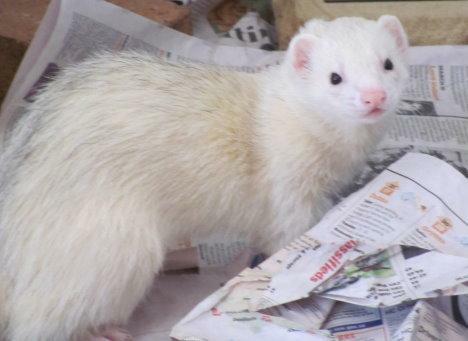 All Animal Minding Service are experienced with ALL types of pets including Tree Frogs, Ferrets, Horses, Pigs, Turtles, Goats, Sun Conures, Rats, Tropical Fish, Poultry, Rabbits, Guinea Pigs, Mice, Lizards and of course Dogs & Cats. Our service begins with an initial free interview where we get to meet you and your pets. To make sure you and your pets are comfortable and confident with our service, we will gather thorough written instructions about your pet’s routine, health and other important information. On each In-Home Service visit your pets will receive excellent care you can depend on. There are no contracts to sign, just detailed pet information to keep them happy while you are away. On each visit a 'Pet Diary' is kept of your pets’ behaviours and we leave a copy for you upon your return. We offer the choice of having your lawn mowed and garden watered. We also have a unique Overnight Stay or a 24 hour House Sitting service that have become very popular for pets that need extra nurturing. This service is ideal for older pets that need help to go out through the night or for young pets needing constant interaction. New Service - Personalized Pet Care with a Caring Family for those pets that don't like to stay at home alone. 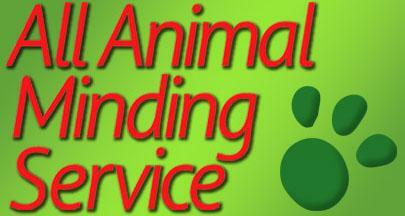 Our Minders are caring & experienced with looking after sick or high needs pets. This includes care for pets with diabetes injections, oral medication and post operative care following surgery. Pets whether furred, feathered or scaled are true members of the family and play a large role in many people's lives. That's why for more and more couples today it only makes sense to consider including them in the Wedding activities. Pets can provide another aspect to the day, and subsequently to your photographs, creating memories and moments that last forever. Imagine arriving on your pet horse to the Wedding Ceremony or galloping away after the nuptials are concluded. All Animal Minding Service will have your horse professionally groomed and delivered to your Wedding location. Pet dogs make great ring bearers. Small birds in decorative cages positioned at the altar. Parrots also are ideal as ring bearers. Cats can be walked down the aisle on a leash. If taking part at your wedding is not what you choose for your pet’s involvement, then consider having them attend the Wedding Photography session only. Animals create excellent photographic opportunities. Whether it is when you’re getting ready or during the actual ceremony, pets can add a measure of spontaneity and fun to the photographs. Even if your pet’s role in the wedding is as simple as sitting next to you, neither you nor your fiancé can really be expected to give your pet your full attention during the wedding. 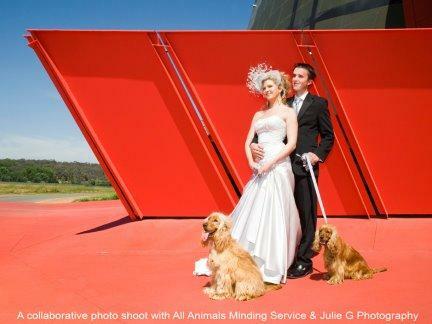 Also you may not want to impose on your wedding guests to poop scoop or mind your pets during the Wedding and that is why Bruce and Anezka of All Animal Minding Service and their professional and experienced attitude towards all animals will be crucial to make your Wedding Day with your pets run as smoothly as possible. Whether your pet’s role is big or small, the most important consideration is that he/she is comfortable at all times. Making this experience as enjoyable for them as it will be for you is Bruce and Anezka’s number one priority. We offer to have your pets groomed by professional Grooming Services to make sure your pet looks its best on your special day. Choose from our three Packages specially designed for individual needs which cover all pets from the smallest to the largest. The Koala Package for people with pet horses or Alpacas. This is a Deluxe Package to enable pet horses or Alpacas to take part in the Wedding Ceremony and the Wedding Photography Session. The Possum Package for a dog or a cat that is going to require grooming. Or any pet such as a rabbit, rat or a parrot that you would like to take part in the actual Wedding Ceremony as well as Wedding Photography Session. The Echidna Package is designed especially for clients with pets that do not require grooming or special transportation. This includes cats and dogs. These pets will not be taking part in the actual Wedding only being delivered for the special Photography Session.